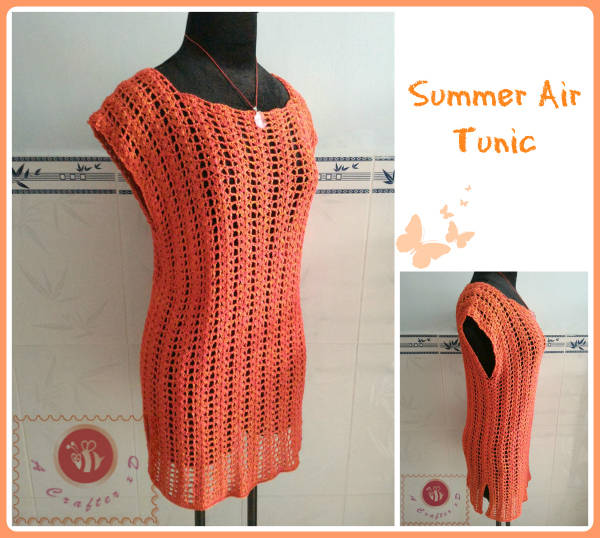 Feel the summer breeze in this crochet lacy – side slit tunic. Made by vivid bright color – mercerized cotton yarn, this is a Spring Summer must-have light weight top. R1: ch 117, dc into 3rd ch from hook ( first 2 ch doesn’t count as 1st dc ), 115 dc across, turn. R2: *dc, skip 2 sts, 2dc-V stitch into next st, skip 2 sts, dc into next st, ch2, skip 2 sts* repeat ** 12 times across, dc into next st, skip 2 sts, 2dc-V stitch into next st, skip 2 sts, dc into last st, turn. R3: *dc, skip 2 sts, 2dc-V stitch into next ch1-space, skip 2 sts, dc into next st, ch 2, skip next ch2-space* repeat ** 12 times across, dc into next st, skip 2 sts, 2dc-V stitch into next ch1-space, skip 2 sts, dc into last st, turn. R59: *dc, skip 2 sts, 2dc-V stitch into next ch1-space, skip 2 sts, dc into next st, ch 2, skip next ch2-space* repeat ** 4 times across, dc into next st, turn. Repeat R59 and R60 at the other side. R56: *dc, skip 2 sts, 2dc-V stitch into next ch1-space, skip 2 sts, dc into next st, ch 2, skip next ch2-space* repeat ** 4 times across, dc into next st, turn. R57: *dc, ch2, skip next ch2-space, dc into next st, skip 2 sts, 2dc-V stitch into next ch1-space, skip 2 sts* repeat ** 4 times across, dc into last st, turn. R58: *dc, skip 2 sts, 2dc-V stitch into next ch1-space, skip 2 sts, dc into next st, ch 2, skip next ch2-space* repeat ** 4 times across, dc into last st, turn. Repeat R56 and R60 at the other side. Thanks for your prompt reply. I dont think that I was clear in my question. Row 57…Front *dc,ch2,skip next ch2-space etc. does Not continue the pattern. Does Not work when crocheting into Row 56????? Is this an error? For the back, I just did what I thought I should. Thanks. Have confusion with Front Row 57……It does not continue in pattern with Row 56. I assume that this is a drcrease but it causes a bumpy lump. It this correct? Hi, there’s no decrease/ increase in this row as the shoulder part should be straight up. 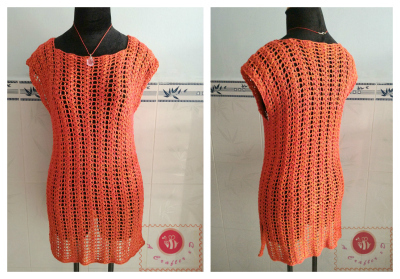 This is how you crochet the other side of the shoulder of each part. Ok, thanks. I just found the link to the pattern on Craftsy. Love the slimming, vertical lines. How does one size the pattern up (or down) to fit different sizes?